Yoann Maestri has played his way through the age grade teams for France before earning a call up to the 2012 Six Nations squad in Philippe Saint-Andre's first selection. The lock was born in 1988 and has had spells at both Toulouse and Toulon. He started his career at RC Carqueiranne-Hyères before moving to Toulon in 2003. He earned his first senior contract in 2007 but made the switch to fellow Top 14 giants Toulouse in 2009. 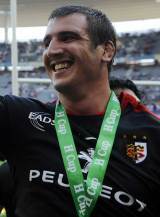 He became an intergral part of their second-row alongside Patricio Albacete and Romain Millo-Chluski and did enough to impress Saint-Andre to be named in the 30-man party for the 2012 Six Nations.